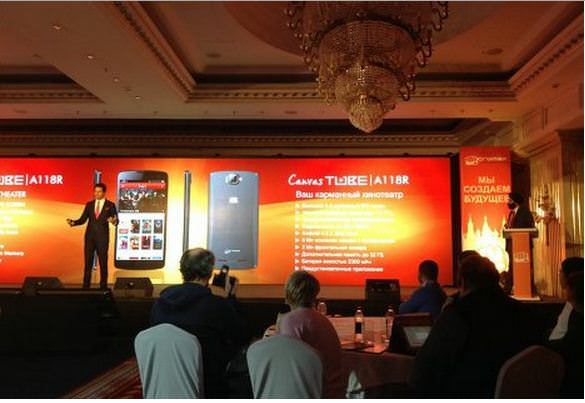 Micromax is reportedly launching an entertainment-focused mid-range smartphone, the Canvas Tube A118R. Indian smartphone maker Micromax has recently entered the Russian market by announcing a number of Android and feature phones. The vendor has also introduced its first octa-core smartphone, the Micromax Canvas Knight A350 in Russia, which is expected to launch in India soon. In addition, the manufacturer has also showcased an entertainment-focused Android device in Russia called the Micromax Canvas Tube A118R. Image Credit – Digit.ru The Micromax Canvas Tube A118R is a mid-range device that boasts a 5.5-inch IPS LCD display (with no details on exact resolution) and a 1.2GHz quad-core MediaTek processor, running Android 4.2. It comes with a microSD card slot to expand the memory upto 32GB, and is powered by a 2,300mAh battery. There is no word about the internal memory and RAM at the moment. The Canvas Tube A118R offers an 8MP rear camera as well as a 2MP front shooter. It comes with the usual set of connectivity features like Wi-Fi, Bluetooth and 3G. We don’t know yet if it comes with dual-SIM network support. Micromax is going to market the Canvas Tube A118R in Russia as a media consumption device, as the vendor has preloaded an app called IVI.ru. The app offers entertainment-based content such as free movies, TV shows, cartoons and music. Micromax will reportedly collaborate with an Indian entertainment content provider to release the phone in the country.